First-person narrators describe their meetings with Judith in ten short stories. 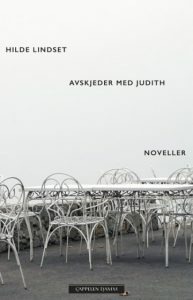 Although the stories are unsorted and idiosyncratic – maybe even because of this – the woman Judith slowly takes shape. Even at the beginning of their relationship, her first boyfriend realized that he was far too ‘normal’ for her. Judith’s former school friend, with whom she lives after the sudden end of a long relationship, realizes that Judith is unable to deal with feelings and Judith makes her feel inferior. Judith’s Berlin lover oppresses her and sees it as a game, but then abandons her for the mother of his child. Unable to open her heart, Judith hurts and gets hurt. Lindset portrays the melancholic picture of a present day human being both ingeniously and subtly. A person unable to handle her own feelings or the feelings of others – a betrayer, as well as a being betrayed. Hilde Lindset (born 1978) holds degrees in Nordic literature and theatre studies. She has taught Norwegian and Norwegian literature at the Goethe University in Frankfurt and currently lives in Berlin. Her literary debut was with "Jeg burde sperret deg inne" ("I should have locked you up") in 2012.